One of the first medicinal mushrooms we introduced at RAW Forest Foods, our Turkey Tail Powdered Extract is made using only select wild-harvested Turkey Tail (Trametes versicolor) fungi from strict ecological sources. Our Cloud Mushroom Turkey Tail Extract has been standardized to contain a 40% concentration of the medicinal polysaccharides present in the fungi, including the clinically relevant and researched compounds PSK, PSP, and VPS. We decided to offer Turkey Tail because of the traditional and modern uses of it, which in our opinion make it a particularly useful medicinal mushroom in helping to protect and guard against the increased rates of certain diseases prevalent in modern society. In Traditional and Classical Chinese Medicine, Turkey Tail (known as (Yun Zhi) is seen to manifest its therapeutic actions in the Spleen, Lung, and Liver meridians. It does so by invigorating the Spleen and eliminating dampness, replenishing Jing (essence) and Qi (vital energy), all through its use as a general tonic and in regulating immune functions. Turkey Tail is considered to be sweet and bland in flavors and slightly cold in nature (perfect for balancing warming or hot Qi tonics). 65 grams total of Cloud Mushroom Turkey Tail Extract. RAW Forest Foods is the premier pro-androgenic and tonic herb company. RAW Forest Foods' Cloud Mushroom Turkey Tail is a standardized powdered extract, with a 40% polysaccharide content, including the important PSK, PSP, and VPS polysaccharides, which are responsible for some of the benefits of Turkey Tail. View our Turkey Tail Powdered Extract quick facts PDF. Turkey Tail mycota (mushrooms/fungi) are one of the top medicinal mushrooms in the world, with extensive traditional use and current medical research supporting the health-promoting attributes of the mushroom. 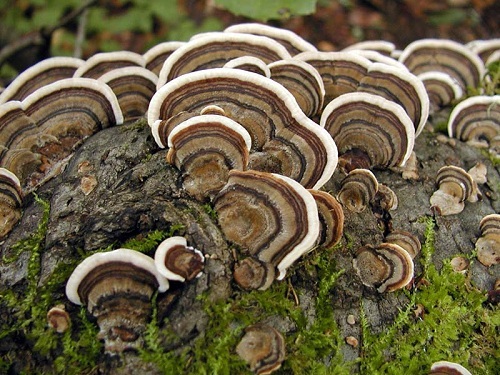 Research in the use of Turkey Tail as an anti-cancer agent has bloomed recently, driven in part by the funding of research by the National Institutes of Health (NIH) into the uses of Trametes versicolor as an adjunct therapy for breast cancer treatment. The Turkey Tail fungi go by several names, including its Latin botanical name Trametes versicolor, Coriolus versicolor, and its traditional Chinese herbalism name Yun Zhi (Ý__ / _©µ¬©ÒÜÎ), which poetically translates to the "Cloud Mushroom." Because of the many positive attributes of this mushroom, we have chosen to employ the name Cloud Mushroom for our Turkey Tail Mushroom, because it better embodies all that this fungus has to offer. Turkey Tail is one of the most common fungi to be found in the woods in temperate forests throughout the world. The common name originates from the banding pattern on the fruiting bodies that resembles (in miniature, of course) the tail of a strutting turkey. The colors of the bands can be quite variable, depending on the genetics of the organism and its environment. Most of the bands are dark to light brown in color, alternating with light colored bands of white to tan, with still more bands of blue, orange, maroon, and other. The can be strikingly beautiful and are among the most easily found fungi. Turkey Tail has a widespread distribution, having been found in nearly every state in the United States and in most other countries. It grows almost anywhere there are trees and can be found in large clusters. However, in its wild, raw state, it is very difficult to extract any beneficial effects from it. Traditionally, tea would be made by boiling the fungi for several hours (similar in preparation to Chaga), and it would only contain a fraction of the beneficial chemicals the mushroom contains. This is why we offer a potent, prepared Turkey Tail extract, providing the most effective benefits possible. Folklore remedies of Turkey Tail include the treatment of lung and liver infections. In China, Turkey Tail has been used as a preventive and curative agent for liver infections and liver cancer. In Japan, it is considered a panacea for a variety of cancers. Overall, the mycelium and fruiting body of the mushroom is considered an immune stimulant and is believed to have anticarcinogenic activity. Turkey Tail mushrooms are one of the most thoroughly researched and respected of the known medicinal mushrooms and fungi. They are medically significant for many reasons but are most popularly known as being the natural source of the anti-cancer polysaccharide PSK. PSK (polysaccharide K) is a high molecular weight carbohydrate found in fruit and, in higher concentrations, in the mycelium of Turkey Tail. Preliminary evidence indicates PSK has anticancer activity in vitro, in vivo, and in human clinical trials. Preliminary research has also demonstrated that PSK may inhibit various cancer onset mechanisms. Our Cloud Mushroom Turkey Tail Extract has been standardized to contain 40% of the active polysaccharides (including PSK) present in the fungi. Research (both in the US and internationally) has validated the unique ability of Turkey Tail mushrooms to attract and kill cancer cells. * In addition, it is a potent immune modulator, increasing the production of T helper cells, those cells which direct the immune system. Furthermore, Turkey Tail may help in repairing or removing mutated cells while also strengthening the immune system by increasing T helper cell numbers. Additionally, Turkey Tail has shown promise as an anti-viral, killing some types of viruses. * Research into the anti-viral properties of Turkey Tail indicates specific actions against Hepatitis C and HPV (Human Papilloma Virus). * Turkey Tail has been the subject of 600 studies and 24 human clinical trials. 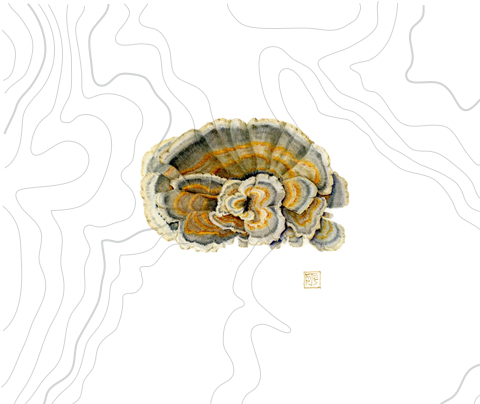 Historically, the Turkey Tail fungus was referred to as Yun Zhi in China. The first mention of Yun Zhi was in the Bencao Gangmu (a.k.a. Compendium of Materia Medica), written by Li Shizhen during the Ming Dynasty (1578 CE). The Bencao Gangmu states that Turkey Tail, Yun Zhi, "is beneficial to one's spirit and vital energy and strengthen one's tendon and bone." Today, in Traditional Chinese Medicine (TCM), Turkey Tail is used to used to clear dampness, reduce phlegm, heal pulmonary disorders, strengthen the physique, increase energy and benefit people with chronic diseases (Yang & Yong, 1989, Ying et al., 1987). Furthermore, Turkey Tail is employed by TCM doctors as a useful treatment for infection and/or inflammation of the upper respiratory, urinary and digestive tracts. Turkey Tail is also regarded as curative to liver ailments (including hepatitis B and chronic active hepatitis) and is used to treat general weakness of the immune system (Ying et al., 1987). 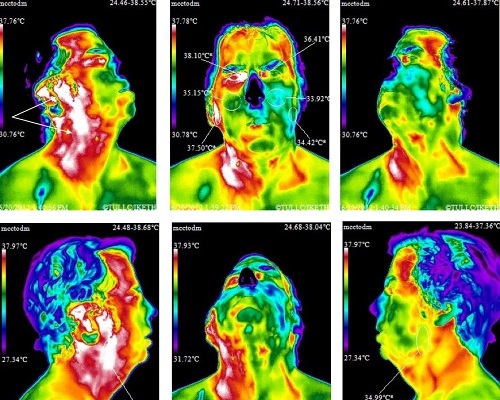 "The thermography shows the inflammation and degeneration caused by cell phone radiation. Notice the white areas from the ear down the throat to the lungs indicating degeneration and the red areas indicating inflammation - all caused by cellular radiation." A multicentered, randomized clinical trial of 262 gastric cancer patients in Japan resulted in PSK improving the 5-year disease-free rate (p = 0.047) and 5-year survival rate ( P = 0.044) when combined as an adjuvant treatment with standard chemotherapy in patients after curative gastrectomy. Another clinical study of 579 patients followed for 5 years also supports the use of PSK as an adjuvant immunochemotherapeutic agent for patients who have had a curative gastric resection. Meta-analysis of clinical trials provides evidence of a survival benefit for stage I gastric cancer with PSK. A retrospective study of 185 patients with non-small cell lung cancer at stages I through III supports the use of PSK as adjuvant treatment after radiotherapy. The 5-year survival rates of patients were statistically significant. Two randomized clinical trials found PSK useful as a maintenance therapy for patients following curative surgical operations for colorectal cancer. In both trials, the survival rate of patients was significantly increased ( P < 0.05) probably because of increased immune system response induced by PSK. An in vitro study with PSP demonstrated antiviral activity against human immunodeficiency virus type 1 infection (HIV-1). The mechanism of action is postulated to include PSK interfering with the binding of HIV-1 to its cellular target. 14 Other in vitro studies in mice suggest a protective effect of PSK against Candida infection mainly through TNF-alpha activity. There are several review articles on PSK as a cancer chemo-preventative agent. The effect is postulated to include induction of immunomodulatory cytokines and cytokine receptors as well as antioxidant activity. All medicinal mushrooms and fungi must be extracted to become bio-available (digestible). Fungi (a.k.a. mushrooms) are composed of a unique polysaccharide called chitin (present in fungi and in the exoskeletons of shellfish). Chitin is not digestible by humans and because of its indigestibility, any nutrients or medicinal compounds present in the fungi are locked away. This is why it is of paramount importance to use mushroom and fungi extracts when using them medicinally. We prefer dual stage hydroethanolic (hot water and alcohol) powdered standardized extracts for our medicinal mushrooms. This guarantees a known, standardized level of medicinal polysaccharides and ensures the widest spectrum of all other compounds in a ready to use and highly digestible form extracts are the standard in the vast majority of scientific and medical research into specific medicinal fungi and these extracts are what we are proud to offer our customers. Our Turkey Tail is a dual stage hydroethanolic powdered extract that has been standardized to contain forty (40) percent polysaccharides. The information contained here and provided by RAW Forest Foods is for informational use only. These products have not been evaluated by the FDA. Any statements within this site or within RAW Forest Foods’ site have not been evaluated by the FDA. This (or any) product is not intended to diagnose, treat, cure, or prevent any disease. In each 65 gram pouch, there are approximately 32.5 servings of Cloud Mushroom Turkey Tail. Very effective. I gave some to my neighbor who had tumors and his tumors disappeared! We're giving some to his grandson who also has a tumor. I came out better than expected on my colonoscopey after taking the mushroom for two weeks. 4 stars from me! Taking this along with Unique-E Tocotrienol which is does not include any tocopherols as a preventative for prostate health based upon. (Read FYI http://www.ncbi.nlm.nih.gov/pubmed/25129068). I have ordered this product multiple times and have been highly satisfied with the product and its results. I am a primary care physician, working primarily with the pediatrics population, and I am routinely exposed to different pathogens, including the onslaught of seasons colds which come walking through my door this time of the year. I have used several products from RAW Forest Foods, and have always been more than satisfied with the quality of their products, but I want to give a specific mention to the immune support that Trametes versicolor (Turkey Tail) has awarded me over the course of approximately 1.5 years of continual use. I do not tend to be a sick person, but I usually end up catching a cold several times a year--similar to the elementary school teacher and her exposure to the common cold. Since starting and using Trametes versicolor I have not been sick once. Not even felt any sickness coming on. This has added greatly to the quality of my work and my life, and I am tremendously grateful to that. If I could recommended a natural product through my work I would, without a doubt. recommend this. But alas, it is out of the scope of medicine. RAW Forest Foods Turkey Tail Extract is the newest supplement that I have order. I only received by order recently so I can't give this product a full review yet, which is why I am only giving 4 stars out of 5. I suffer from chronic fatigue syndrome (low energy, body pain and soreness, lowered immune system) and so far my energy is feeling better and I am more able to complete the tasks that I need to complete. No sickness scares yet, but based on what I have read I am sure this supplement is helping strengthen my immune system. This is my first order from RAW Forest Foods, and while I am always skeptical with ordering from new-to-me companies this one is "so far so good."